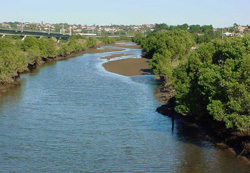 Seaway from Toombul, Shultz Canal, alias Kedron Brook, becomes tidal and the mangroves start. The bit of linear park between Toombul and Hedley Avenue with its new official name - Zion Hill Park - is part of the terrain under the eye of a re-vamped bushcare group. It is easy to believe this was once an important trading and meeting place of the Undumbi, part of the Gubi Gubi nation and probably others as well because you can row a canoe (or motor a boat) up Shultz Canal at high tide. Some time in the future the Zion Hill Bushcare Group hope to do a bush tucker planting to acknowledge the custodians of this place. The park surrounding the cemetery, part of the Albert Bishop Park, is called German Mission Park as this was also the site of the first free white settlement in Queensland - with the establishment of the German Mission for Indigenous peoples. A short tributary, its name awaiting retrieval, little more than a series of water holes, flows along the back of the cemetery into Shultz Canal. Maybe it was the seminal place for introduction of weeds to Queensland, (and they remain vigorous still) but more importantly, it contains a remnant stand of Melaleuca, (Melaleuca quinquenervia) one of the last in the Kedron Brook catchment. By the early 1990s, this patch was “pretty horrific” recalls Kharyl Scott. It was overgrown with huge Camphor Laurels and Mile-a-Minute. In March 1992, she prepared a submission to the Brisbane City Council to regenerate the bushland in the cemetery locale and called on others to “Take Time to put a little back into Your Community”. The Council first cleaned out the tributary and cut down the Camphor Laurels. With considerable community building skills at her disposal, Kharyl managed to orchestrate a large group of diverse people to come together for a big planting along the edge of the tributary and its waterholes. A core group continued to weed and water, tending the trees. People with property adjoining or nearby to the park took on a proprietary interest. Unfortunately with school holidays soon after the planting, a lot of trees were ripped out. A second big planting, after the summer holidays, with the schools involved (the Council having bought in a post-hole digger) saw over 350 trees planted. This time, the Council bulldozers moved in to drain the tributary and destroyed a lot of the plantings. Undaunted the group continued to tend. Occasionally a fire truck would turn up when Daryl Smith from the local Fire Brigade came down to do some weeding. Seed taken from the area was propagated by Council. In 1993 Patricia Vaughan, then Alderman for Eagle Farm predicted that in ten years time the place would be “a cool, pleasant, leafy area which is attractive to wildlife”. When we walk the park now, we can see Blue Wrens; Red breasted Wrens and the usual Butcherbirds, Magpies, Stormbirds and parrots. We get Red-bellied Black and Green Tree snakes, Water Dragons and more. We need the buffer the vegetation provides more than ever. It is the Kookaburra that seems to echo, for me, what the energy of the place can be. The first group climbed trees and put up nesting boxes for the possums. When the initial enthusiasm of the Cemetery Bushland Group started to wane - Nundah had a large population of elderly people - Brisbane City Council took a more active role in organising plantings. In about 1996 at least thirty locals turned up to plant. Council contractors maintained the site and, after a second community planting about two years ago, also did some plantings. 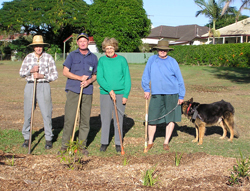 And so the seeds of the current Zion Hill Bushcare Group were sown and, through word of mouth, mostly with conversations in the park itself while out walking the dog, a core of dedicated bushcare volunteers have formed a group and are planting and weeding. The Nundah Community Centre network had an input in our third gathering and will extend the group. The task is potentially overwhelming, given the weeds, but with the experienced input of Council workers and Kharyl Scott, among others, we plan to focus area by area on confinable parts. We have grand visions, of course, and hope to see joint plantings with the Nundah Reconciliation Group, Greening Australia, Men of the Trees and the local schools and you, too, if you have a spare moment or two.